I am admittedly not really wowed so much by chocolate cookies. I’m not sure why, as I love chocolate, but an actual chocolate cookie usually doesn’t do much for me. Give me an ooey gooey chocolate chip cookie any day. However, when I saw this cookie on Shawnda’s blog, I was reeled in. Yes, she had an awesome picture, but that wasn’t it. It was four little letters hidden in her description: O-R-E-O. I am a sucker for those little two-toned sandwich cookies… and my favorite cheesecake is an OREO® cheesecake. When Shawnda claimed that these tasted just like that little cookie, the deal was sealed. The post was starred, white chocolate was added to my grocery list, and off I went! And let me tell you – these taste exactly like an OREO® cookie – a very moist, chewy OREO®. Perhaps the best part of this recipe is that there are no eggs, so go ahead and eat this dough straight from the bowl until your heart is content (I could be speaking from experience). I actually think that this dough would be wonderful frozen and incorporated into an ice cream cake or used in a million different ways. It’s just THAT good. My cookies didn’t spread quite as much as hers did, which was a bit of a bummer because hers were so very pretty. But taste was not sacrified – these are fabulous! They take just a few minutes to mix together, so what are you waiting for? Go make them! Now! *Substituting with natural unprocessed cocoa is not recommended. The Oreo-like flavor comes from the richer dutch-processed cocoa. I used Hershey Special Dark blend of dutch-processed and natural because I cannot find pure dutch-processed in these parts for the life of me! Whisk together flour, salt, baking powder and cocoa, and set aside. Beat the butter on medium-high until light and add sugars, creaming well. Add the vanilla and beat until smooth. Add the flour mixture in 2 batches, alternately with the milk in one batch, mixing well. Using a spatula, mix in the white chocolate. Chill dough for 15 minutes. 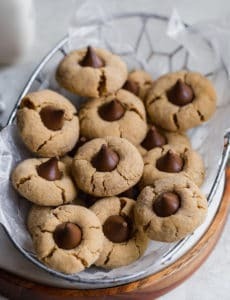 Scoop the dough onto a parchment- or silpat-lined cookie sheet, press down on them slightly, and bake (see note below). 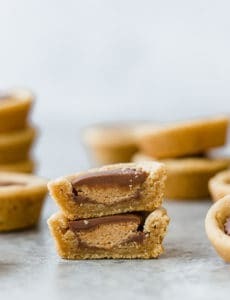 Let the cookies cool completely on the cookie sheet and store in an air-tight container. Note: Shawnda states that she uses a No 12 scoop to drop a well rounded scoop of chilled cookie dough (a little less than 1/2 cup of cookie dough) and bakes for 24 minutes. At this size she gets 8 or 9 cookies with a diameter of 6 inches using the No 12 scoop. If you scoop a more normal sized cookie, she estimates 12-16 minutes in the oven. I used a large cookie scoop from Pampered Chef, which is approximately 3 Tablespoons in size, and I got 13 cookies out of my batch, with 18-20 minutes in the oven seeming to do the trick. These cookies taste just like oreos! 1. Preheat oven to 325 degrees F and line baking sheets with silicone baking mat or parchment paper. 2. Whisk together flour, salt, baking powder and cocoa, and set aside. Beat the butter on medium-high until light and add sugars, creaming well. Add the vanilla and beat until smooth. Add the flour mixture in 2 batches, alternately with the milk in one batch, mixing well. Using a spatula, mix in the white chocolate. Chill dough for 15 minutes. 3. 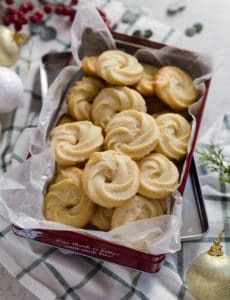 Scoop the dough onto a parchment- or silpat-lined cookie sheet, press down on them slightly, and bake (see note below). Let the cookies cool completely on the cookie sheet and store in an air-tight container. Note #1: Shawnda states that she uses a No 12 scoop to drop a well rounded scoop of chilled cookie dough (a little less than 1/2 cup of cookie dough) and bakes for 24 minutes. At this size she gets 8 or 9 cookies with a diameter of 6 inches using the No 12 scoop. If you scoop a more normal sized cookie, she estimates 12-16 minutes in the oven. I used a large cookie scoop from Pampered Chef, which is approximately 3 Tablespoons in size, and I got 13 cookies out of my batch, with 18-20 minutes in the oven seeming to do the trick. Note #2: Substituting with natural unprocessed cocoa is not recommended. 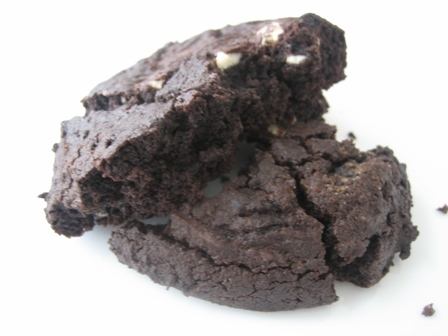 The Oreo-like flavor comes from the richer dutch-processed cocoa. I used Hershey Special Dark blend of dutch-processed and natural because I cannot find pure dutch-processed in these parts for the life of me!